Mirotec is an international company run by medical and veterinary professionals that understand all aspects of human and animal healthcare and performance. 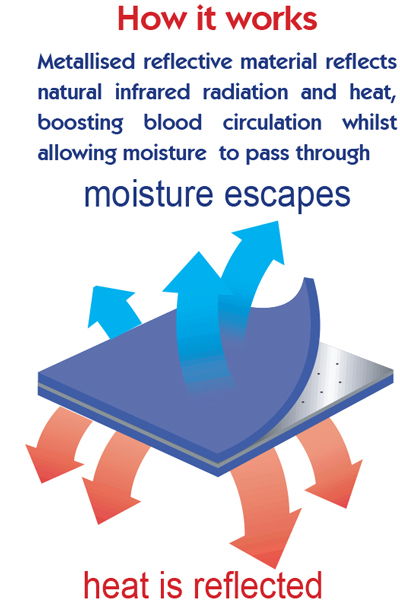 Mirotec ‘space blanket’ technology was invented by British vet, Nick Mills in 1993 and the Mirotec company was founded in 1995 in Australia by Colin Gill. Mirotec products are now selling in countries around the world and the company is rapidly becoming recognised as a world leader in heat reflective infrared treatment technology. Mirotec’s Heat Reflective products provide safe, effective and inexpensive heat treatment that can be safely used by humans and animals. While the overall qualities of warmth and heat have long been associated with comfort and relaxation, heat therapy goes a step further and can provide both pain relief and healing benefits for many types of equine back and joint pain. An easy to use, effective, proven and inexpensive solution in the form of MIRoTEC heat therapy products are simple to apply and maintain. How heat therapy works for back pain. Many episodes of equine back pain in both the saddle and the sacro-iliac area result from strains and over-exertions, creating tension in the muscles and soft tissues around the lower spine. As a result, this restricts proper circulation and sends pain signals to the brain. Muscle spasm in the lower back can create sensations that may range from mild discomfort (reduced performance) to excruciating back pain (inability to perform). Heat therapy can help relieve pain from the muscle spasm and related tightness in the lower back. There are several other significant benefits of heat therapy that make it so appealing. Compared to most therapies, Mirotec heat therapy is very inexpensive compared to massage and magnetic Heat therapy is also easy to do – it can be done in the stable or when turned out and MIRoTEC provide specific heat wraps to target the treatment to just where it is needed. For many horses, heat therapy works best when combined with other treatment modalities, such as massage physical therapy and exercise. Relative to most veterinary treatments available, heat therapyis appealing to many equine performance disciplines because it is a simple, non-invasive and nonpharmaceutical form of therapy. Because of its effects on circulation, metabolism and nerves, heat also plays a vital role in the rehabilitation of chronic injuries. Such injuries, defined as having symptoms that persist or develop over time, present a special challenge to diagnose and to treat in horses. Horses can adapt and compensate by shifting weight from the injured area to another limb; unfortunately, this results in more strain on other parts of the body. When these compensatory changes exhaust the supporting structures, atrophy and lameness develop from disuse of the painful area. With chronic injuries, it is essential to address the cause of pain and dysfunction, not just the symptoms. Among the types of injuries and conditions which can benefit from heat therapy are: arthritis, tendonitis, bursitis, ‘cold backs’ and muscle soreness. Veterinary MIRoTEC® is a versatile, light and user-friendly physical-therapy aid that can reduce health problems due to soft tissue damage, aid recovery time and enhance the performance of your horse. Research indicates that reflecting Infrared Radiation promotes the healing process and assists recovery due to improved circulation. MIRoTEC® Reflective Therapy Rugs & Wraps capitalize on the body’s ability to heal itself. Designed by veterinary surgeons in England to assist in the treatment of soft tissue injuries. Veterinary MIRoTEC® utilizes Space Blanket Technology, a micro-perforated, metalized reflective material laminated to a supportive polyester substrat is proven to reflect Infrared Radiation emitted by the body. The immune system is stimulated by passage of lymph in the lymph nodes. This applies to both cellular immunity & humoral. Immune reactions & antigen/antibody presentation are activated by the stimulation of lymph circulation. Lymph in its flow actually takes away the toxins, the germs, & the large molecules that the venous system can’t regain. It can, in particular, remove “trapped proteins” & fat molecules in the tissues. Finally as it passes through the lymphatic nodes, small centres of filtration, it also manages our immune defences. Lymph leaves the waste & germs in the lymphatic nodes, & transports lymphocytes, specialized white corpuscles that produce antibodies. It is easy to understand, therefore, its importance for the strength of our immune system, the state of our tissues & our general well-being. However, the lymphatic flow can stagnate or even stop for many reasons such as: e.g. fatigue, stress, emotional & muscle shock, lack of physical activity, certain food additives If the lymphatic circulation slows down, the supplying & regeneration of cells is poorly carried out. Consequently, toxins accumulate, hastening the aging process & opening the gates to various physical problems. By using Mirotec’s range of Treatment Rugs and products for treatment, travel, and general well being of your horse/s, you can maximise the performance of your horse by ensuring that it is always fit, relaxed, warmed-up and ready to go. Mirotec Treatment Rugs are perfect for treating horses with sore and cold backs, arthritis, sacroiliac injuries and muscle strains. Our Treatment Rugs also help prevent tying-up and increase detoxification, improving recovery time after strenuous exercise. They are very beneficial when used as part of your warm-up and cool-down regime – without expending any extra energy! Our Treatment Rugs have two internal, removable panels for targeted heat treatment and heat regulation. The front panel is designed to treat the saddle and wither area and the rear panel treats hindquarters and the sacroiliac area. Use a Treatment Rug for transport ensuring your horse travels warmed-up and ready for exercise during training or for competition. Mirotec Treatment Rugs are used by leading competition trainers and riders for all types of competitive events, pre- and post-exercise. Mirotec’s range of equine products can also assist in the treatment of shoulder and tendon injuries, muscle strains and spasms, shin soreness, arthritic joints and knees.